This is part of a series on the neighborhoods of the area I primarily work, which includes La Mesa, San Carlos, El Cajon and Santee. 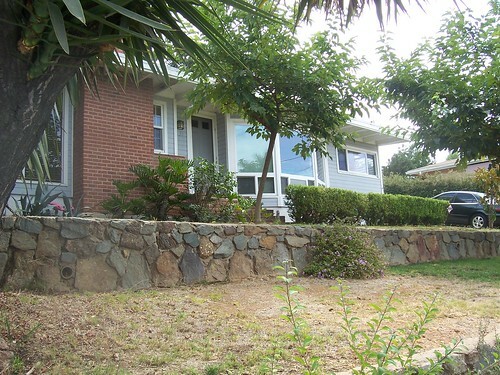 For this one, we're in the northwest part of La Mesa, north of Maryland Avenue Neighborhood. The Lake Murray neighborhood is vaguely teardrop shaped, with the "point" headed south. It begins right at Baltimore and Aztec, then Lake Murray Boulevard and El Paso north right to the San Diego City Limits, and west to the reservoir. 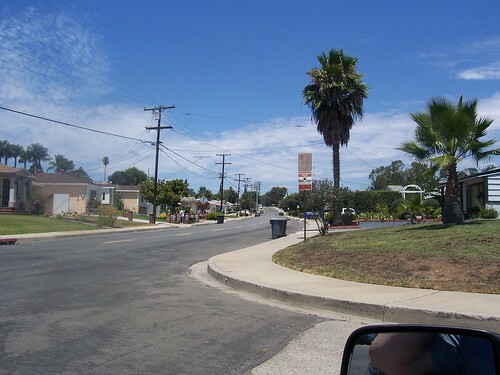 The neighborhood north of it in San Diego city is similar. The Wellesley Street neighborhood is mostly a little older. Lake Murray is a mixed professions neighborhood. You will find everything from young professionals starting out to older working class retirees here. The main commercial area is around the intersection of Lake Murray Boulevard and Baltimore Drive, with extensions south on Baltimore Drive and north-easterly along Lake Murray Boulevard. The Lake Murray was area was basically built in one extended period, starting in the early 1960s and stretching to the late 1970s. Physically, the houses are mostly single story three to four bedroom 1.75 bath houses from around 1500 square feet going up from there to maybe 2000 square feet, sitting on lots of anywhere from 5000 square feet up to maybe 7000. 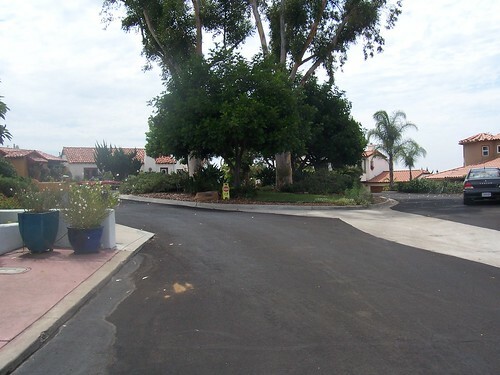 The lots are smaller, and the houses bigger, than in many parts of La Mesa. 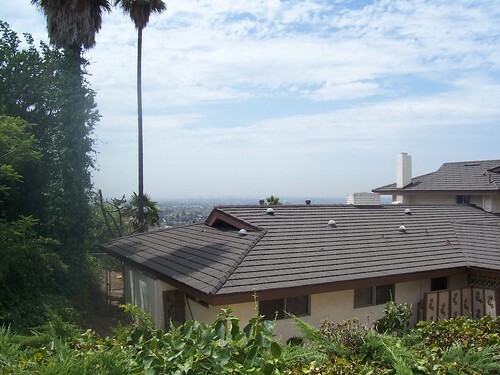 Unusually for La Mesa, great views are comparatively rare - the terrain is lightly rolling, and the majority of lots don't look up or down at much of anything, but there are exceptions. The construction is pretty much all wood frames and stucco on concrete foundations - I can't think of any exceptions off the top of my head. Originally, they were all cookie cutter tract housing, but there has been some differentiation in the last thirty to forty years as people built additions and such. 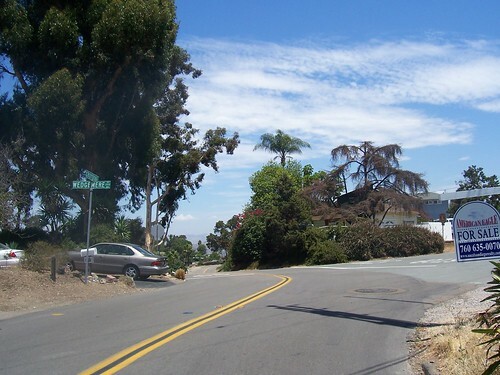 There are significant concentrations of high density housing along Baltimore Drive and Cowles Mountain Boulevard just north of Lake Murray Boulevard, as well as Lake Park Drive between them - right where people are likely to notice it - but the rest of the neighborhood is pretty much single family residences. As of this writing, asking prices in the neighborhood start at about $130,000 for condos and PUDs up to $350,000, while single family detached properties vary from $400,000 to $600,000, with most being towards the lower end of that range. Even with the people who are in distress situations, there are a total of 16 condos and PUDs, but only 3 single family residences for sale in the neighborhood. There generally is not a lot of turnover in this neighborhood. 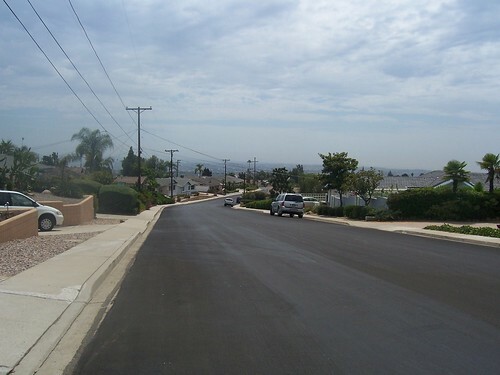 The closest community college is Grossmont, the closest four year college is San Diego State University, which is mostly closer as far as this neighborhood is concerned. The Lake Murray neighborhood is a pretty nice place to live. Transportation access is pretty good. Interstate 8 can be accessed via Lake Murray Boulevard and Fletcher Parkway via Baltimore Drive, and CA 125 is also easy to get to. 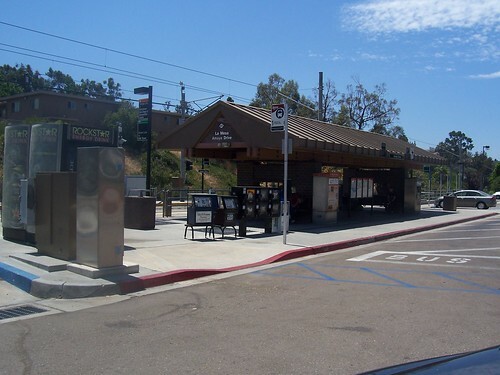 Lake Murray and Baltimore are both bus feeder routes, and the San Diego Trolley is just south of Interstate 8 with a stop just east of Lake Murray, as well as at Grossmont Center. You have your choice of several major supermarkets within a mile or so. You can get to Mission Valley in fifteen minutes, downtown about twenty, door to door. Major shopping centers are found at Grossmont Center (Target, Wal-Mart, Macy's, Theaters and dining), Parkway Plaza (Sears) and College Grove (WalMart, Sam's Club). 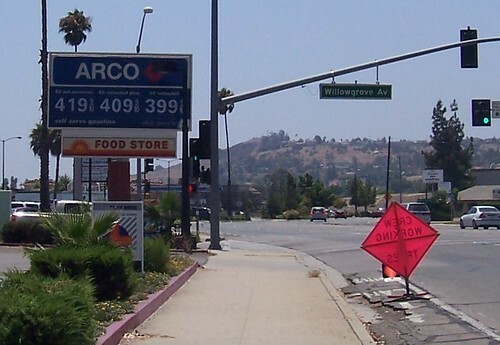 There is also a major commercial strip along Fletcher Parkway between Interstate 8 and Grossmont Center. 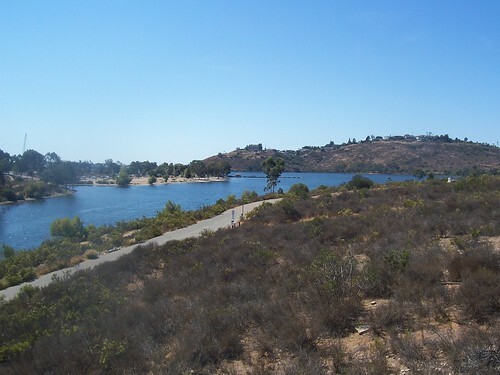 If you'd like to talk more about Lake Murray or any other neighborhood of La Mesa, Contact me. I will be happy to discuss which neighborhoods might be right for you, or the marketing of your current property for an advantageous sale. This is part of a series on the neighborhoods of the area I primarily work, which includes La Mesa, San Carlos, El Cajon and Santee. 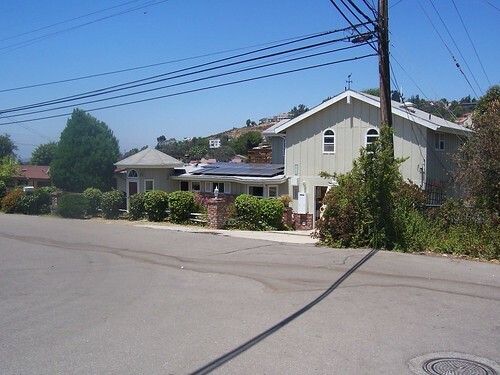 For this one, we're in the central part of La Mesa, uphill from the Normal Avenue Neighborhood, while being south of Summit Hill. 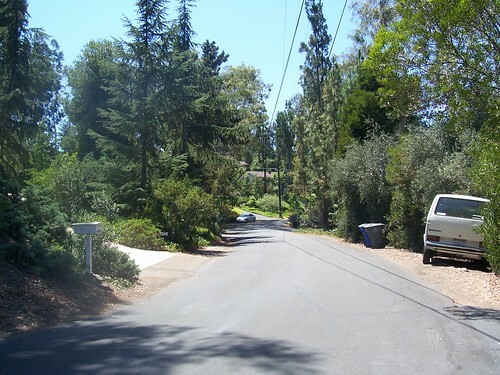 This neighborhood includes everything up on the hill south of Junior High Drive and Orien and east of Murray Hill Road, up to the intersection of Summit and Eastridge Drive. 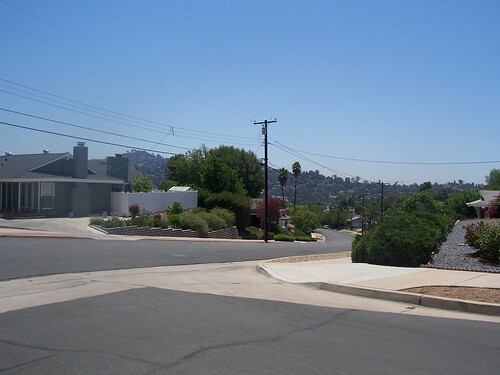 Eastridge is a mostly a professional neighborhood, probably La Mesa's most expensive neighborhood after Mt. Helix. 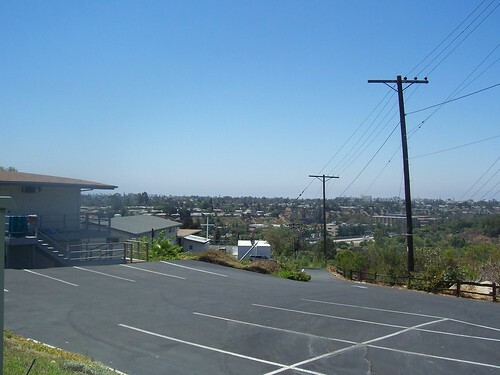 These lots are all high enough up the hill that if there's a property without a great view in the neighborhood, I don't know about it, and the ones near the top have panoramic views of the entire area, whether they're on the northwest side looking towards the ocean and Mt. Soledad or the southeast side looking towards the mountains, and a lucky few get both. There isn't a better view in east county, and there may not be a better one anywhere in San Diego. There are no commercial roads within the area. It's all residential, and I cannot name even an apartment building or duplex in the entire neighborhood. Single family detached housing, 100% of it. It's pretty trivial to get to the stores, but there is nothing commercial or multi-family within the neighborhood itself..
Eastridge was built out in two stages: One in the late fifties and early sixties, and another very recently, as there had been some shenanigans with the land the newer part of the neighborhood sits on. 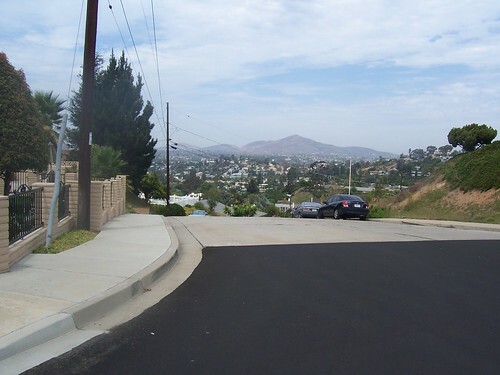 The older part of the neighborhood does have the better views and sits on the higher, northeastern end, while the lower, southwestern end is where the newest housing sits. 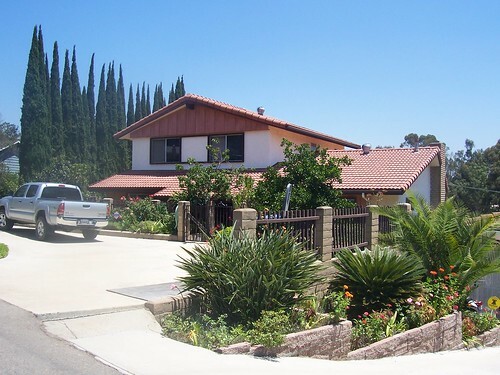 The older part of the neighborhood also does not have an HOA, while the newer part does. Physically, the first generation houses are mostly single story 3 bedroom or more, 2 bath or more houses from around 1800 square feet going up from there to well over 3000 square feet, sitting on lots of anywhere from 7000 square feet up to maybe 12000 or so in the older part of the neighborhood, while the recently built properties are mostly two story in the range of 2500 square feet and up, pretty uniformly sitting on lots of about 5000 square feet. 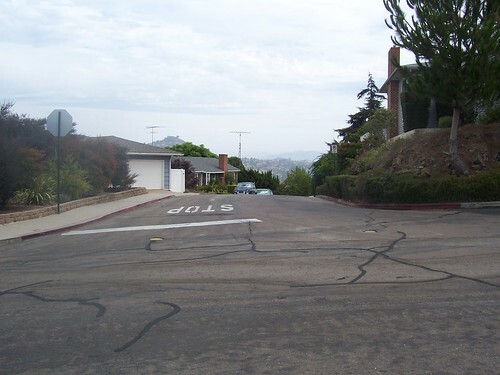 Many of the lots have a heavy slope so less is usable than most people might expect. The houses in the older part of the neighborhood are pretty much all individual, the ones in the newer part are all cookie cutter tract housing. Pretty much all of them have concrete foundations. The ridge is essentially bedrock, so foundation issues and settling have always been rare. As of this writing, asking prices in the neighborhood start at about $500,000 and go up to over a million, with a typical property being somewhere in the 700s. This is down significantly from a couple of years ago, but activity is pretty consistent. The neighbors will be business people and professionals. 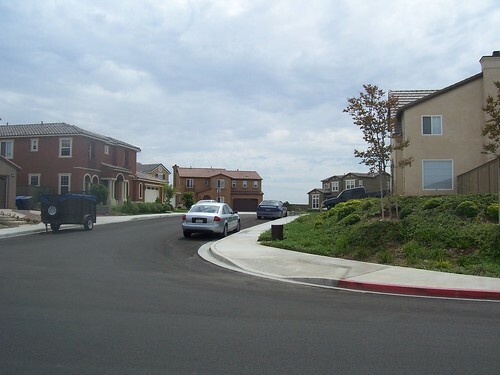 People making San Diego Area Median Income need a down payment in the area of $200,000 or so to afford the Eastridge neighborhood. Even with the people who are in distress situations, there are a grand total of 11 properties for sale in the neighborhood. There generally is not a lot of turnover in this neighborhood. The closest community college is Grossmont, the closest four year college is San Diego State University, which is actually closer. 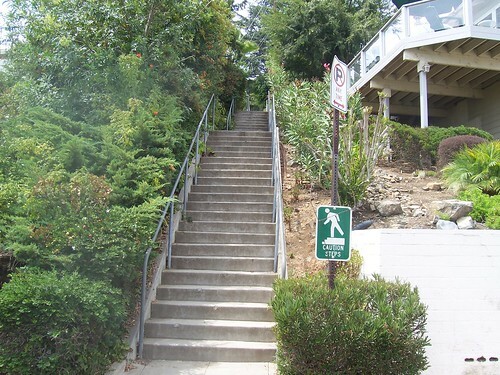 The Eastridge neighborhood is a prestigious place to live, but it does have good transportation access. 94 can be accessed via Yale Avenue or Massachusetts, Spring Street goes to Interstate 8 and 125 as well - You should be on the freeway within five minutes of leaving your driveway. You have your choice of several major supermarkets within a mile or so. You can get to Mission Valley in fifteen minutes, downtown even quicker. The San Diego Trolley runs close to the neighborhood, although not within it - lots of people park in the lot at the Spring Street stop and ride it downtown. 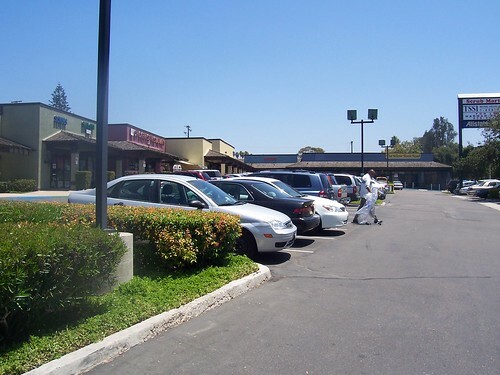 Major shopping centers are found at Grossmont Center (Target, Wal-Mart, Macy's, Theaters and dining), and College Grove (WalMart, Sam's Club), and there is La Mesa Springs Center just down hill from the neighborhood as well as all sort of other stores in many avenues nearby. 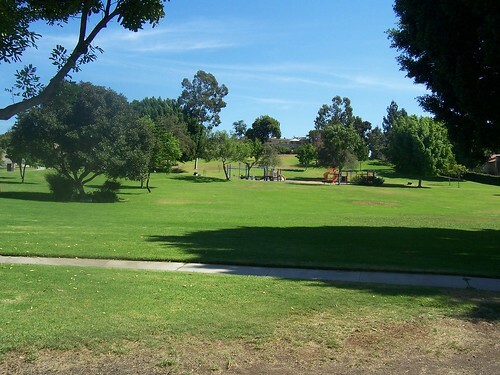 If you'd like to talk more about Eastridge or any other neighborhood of La Mesa, Contact me. I will be happy to discuss which neighborhoods might be right for you, or the marketing of your current property for an advantageous sale. This is part of a series on the neighborhoods of the area I primarily work, which includes La Mesa, San Carlos, El Cajon and Santee. 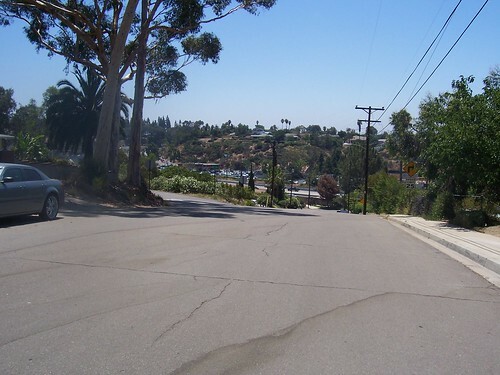 For this one, we're in the central part of La Mesa, just uphill from and wedged between The Village (aka Downtown La Mesa) and the Normal Avenue Neighborhood. I've heard this area called Windsor Hill and Pasadena Hill as well, but I'm going to use the name I learned growing up near there. Some people think it's even part of the Village, but it is a distinct neighborhood, and property values are mostly higher than The Village. 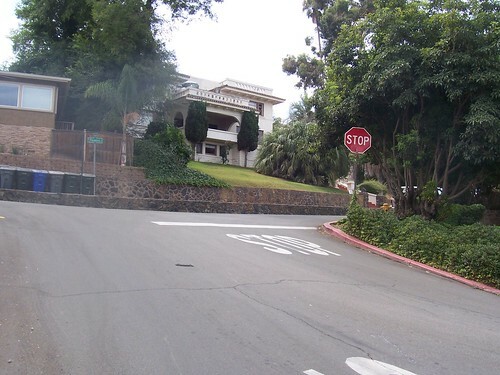 Summit Hill is mostly a professional neighborhood, and is bounded by Normal Avenue on the west, Fairview Avenue, all the houses above Acacia Avenue, and a line running up the hill to the Intersection of Summit Drive and Eastridge, and thence back down to Normal Avenue at the Windsor and Avon intersections. 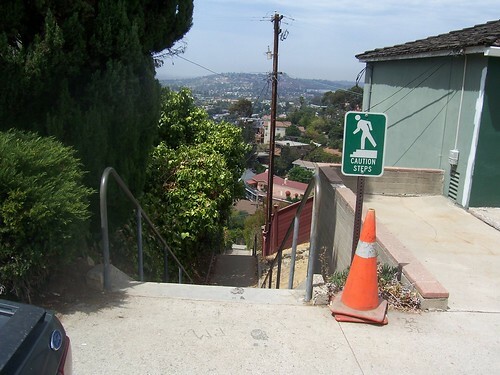 I understand that this neighborhood was the original area for La Mesa's well-to do. Most of the houses were built in the 1940s and before. 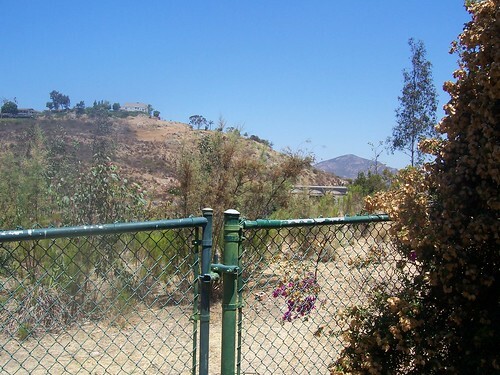 They are built high enough up the hill that if there's a property without a great view in the neighborhood, I don't know about it, and the ones near the top have panoramic views of the entire area, whether they're on the western side looking towards the ocean and Mt. Soledad or the eastern side looking towards the mountains, and a lucky few get both. There isn't a better view in east county, and there may not be a better one anywhere in San Diego. This is from about halfway up, on Pasadena looking west. I could see Mt. Soledad, but it didn't come out in the picture. There are no commercial roads within the area. It's all residential, and with the exception of a few two unit places on Fairview, they are are single family dwellings. There are commercial areas all around, but nothing within the neighborhood itself. Physically, the houses are mostly single story 3 bedroom or more, 2 bath or more houses from around 1500 square feet going from there on up to maybe 2500, sitting on lots of anywhere from 7000 square feet up to maybe 12000 or so, with a very few smaller than that added as fill in after most of the neighborhood. The houses are pretty much all individual. 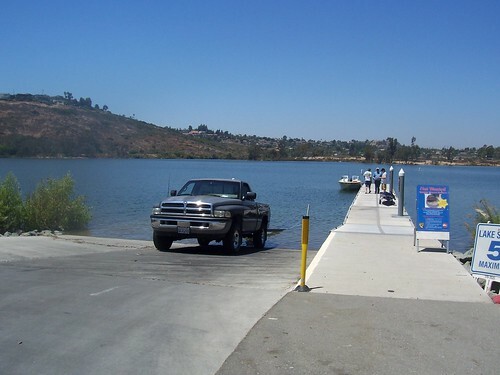 Most use the older pier support, but you there are concrete foundations in a few. The hill is essentially bedrock, so foundation issues and settling were rare in former times, and those that existed should have long since been dealt with. As of this writing, asking prices start at about 400,000, but three of the five properties for sale are asking over $600,000 and one is over $900,000. 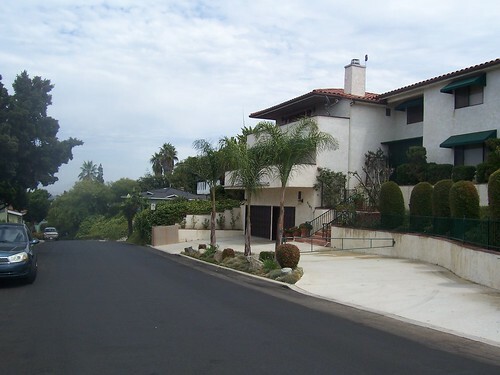 It's usually tough to find a property for sale on Summit Hill, and people earning San Diego Area Median are going to need a six-figure down payment or a major fixer (extremely rare). 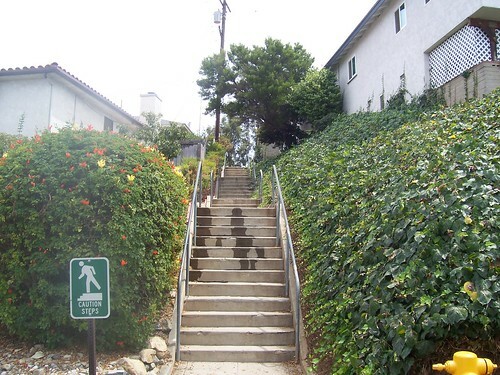 The Summit Hill neighborhood is a prestigious place to live, but it does have good transportation access. 94 can be accessed via Yale Avenue or Massachusetts, Spring Street goes to Interstate 8 and 125 as well - You should be on the freeway within five minutes of leaving your driveway. You have your choice of several major supermarkets within a mile or so. You can get to Mission Valley in fifteen minutes, downtown even quicker. The San Diego Trolley runs close to the neighborhood, although not within it - lots of people park in the lot at the Spring Street stop and ride it downtown. 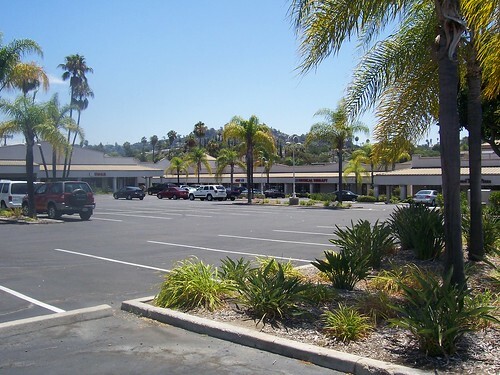 Major shopping centers are found at Grossmont Center (Target, Wal-Mart, Macy's, Theaters and dining), and College Grove (WalMart, Sam's Club), and there is La Mesa Springs Center just down hill from the neighborhood as well as all sort of other stores in many avenues nearby. This one is looking north from the same spot. 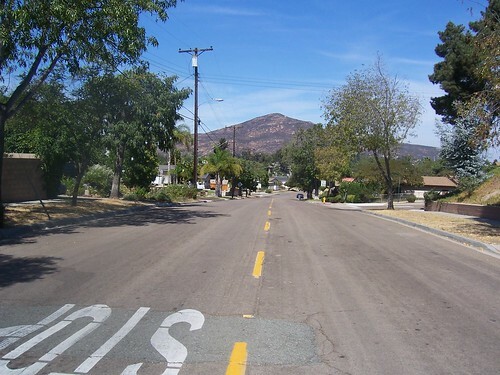 The hill in the near right is Del Cerro Heights. This one is looking east from the same spot on the street level. You can see Mt Helix and Grossmont, but the mist was limiting visibility. When it's good, you can see Cuyamaca Mountain. 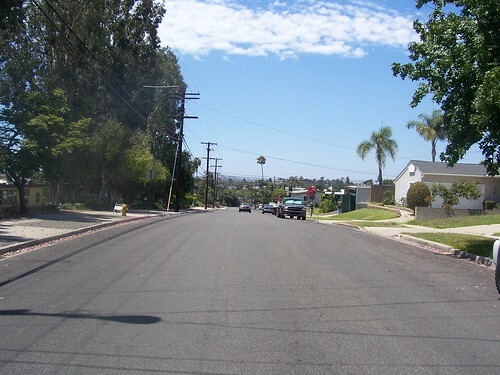 If you'd like to talk more about Summit Hill or any other neighborhood of La Mesa, Contact me. I will be happy to discuss which neighborhoods might be right for you, or the marketing of your current property for an advantageous sale. 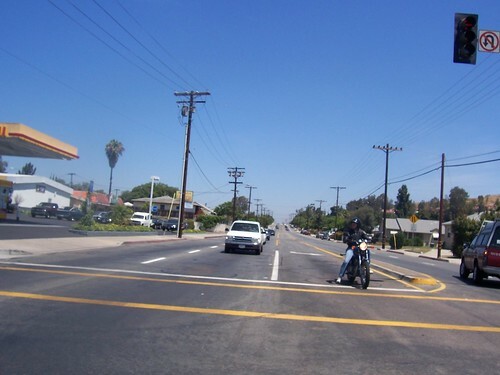 Normal Avenue is mostly a working class neighborhood, and is bounded by Yale Avenue on the west, University Avenue on the north, La Mesa Boulevard on the east, and Normal Avenue on the south. 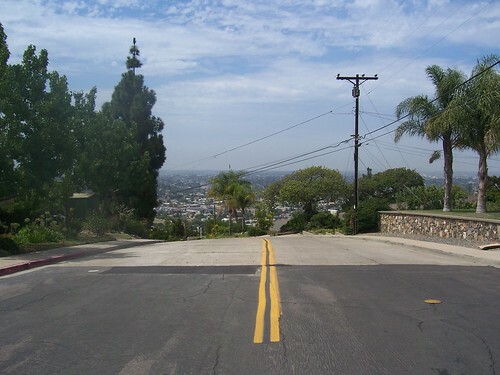 Normal Avenue itself curves sharply to the north to meet La Mesa Boulevard, so if you were looking down from an airplane, it would not appear to be a rectangle. 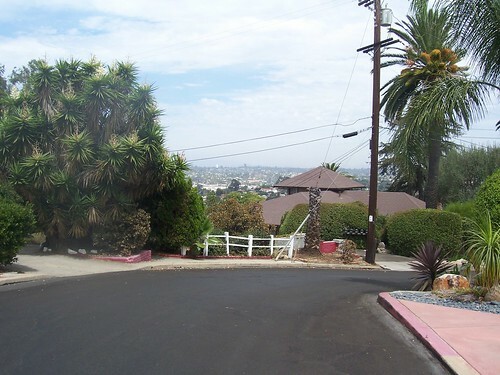 The area south of University is broadly similar, and some pricier homes are found at the edges of the Normal Avenue neighborhood, as well as uphill from it. The only real commercial road serving the area is University Avenue. 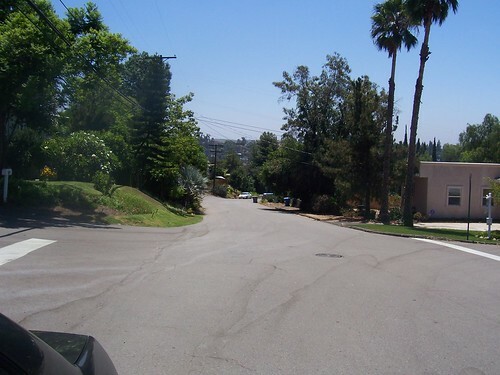 The views vary from basically flat to to excellent, looking mostly looking north and west, with properties near the tops of Orien, Yale, and Normal Avenues having the best views. Physically, the houses are mostly single story 3 and 4 bedroom, 2 bath houses from around 1200 square feet to around 1600, sitting on lots of about 7000 to 8000 square feet. Some lots are as big as 12000 square feet or so, a few may be as small as 5500. Many have been added onto, and they've pretty much all got individual character. Most were built before tract housing became popular in the 1950s, but a few were built as fill in or replacement later on. Many use the older pier support, but you will find concrete foundations in maybe 20% of the houses. Foundation issues and settling were not rare in former times, but those that existed have mostly long since been dealt with. The vast majority of the neighborhood is single family detached housing, but there are some apartments and condominiums along Lowell, the western end of Normal, and also Parks between the elementary school and middle school. As of this writing, asking prices start at about $260,000 and go up to $550,000 for detached properties, but there are only seven detached properties and six condominiums and townhomes for sale in the neighborhood. The Normal Avenue neighborhood is a good place to live, with good transportation access. Yale Avenue goes over the hill and down to 94 West. It's five minutes to Interstate 8. You have your choice of several major supermarkets within a mile or so. You can get to Mission Valley in fifteen minutes, downtown even quicker. Two lines of the San Diego Trolley run close to the neighborhood, although not within it. University Avenue is a major bus route. 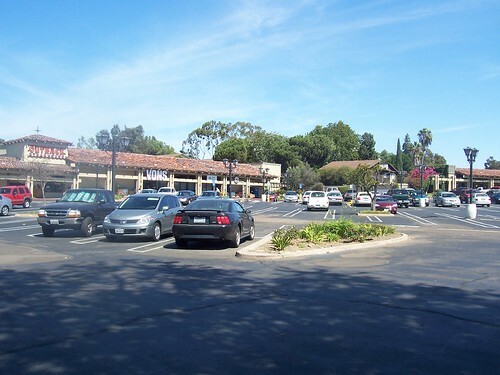 Major shopping centers are found at Grossmont Center (Target, Wal-Mart, Macy's, Theaters and dining), and College Grove (WalMart, Sam's Club), and there is La Mesa Springs Center at the east end of the neighborhood as well as all sort of other stores in many avenues nearby. 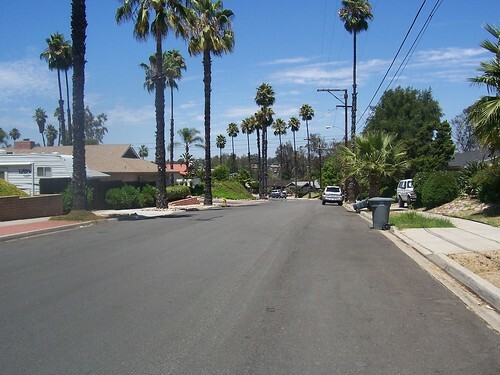 If you'd like to talk more about Normal Avenue or any other neighborhood of La Mesa, Contact me. I will be happy to discuss which neighborhoods might be right for you, or the marketing of your current property for an advantageous sale. 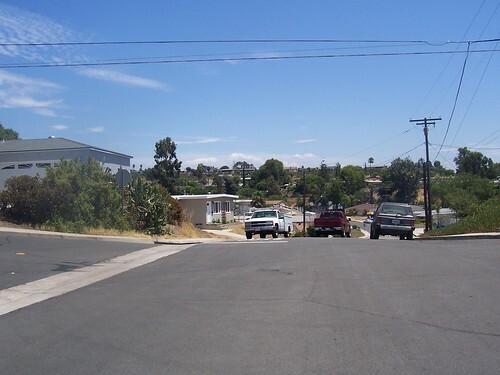 This neighborhood is bounded by the San Diego City Limits, Lake Murray Boulevard, and Lake Murray itself, and sits on the side of a hill above where Lake Murray would drain if anything ever happened to the dam. 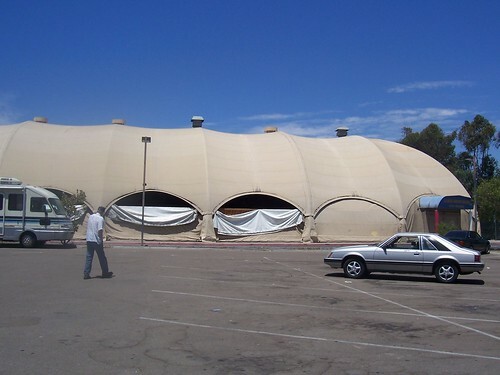 The adjacent area of San Diego City may be a little more recent, but sits on lower softer ground. 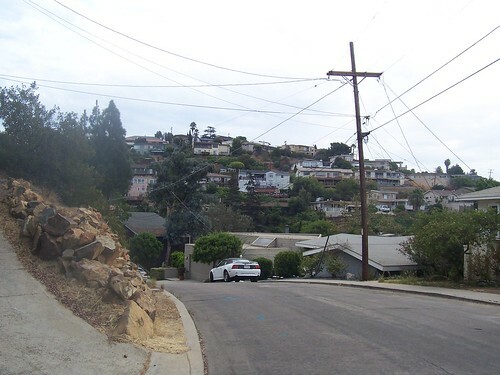 The block or so immediately north of Interstate 8 does get freeway noise, but the rest of the neighborhood is quiet due to the way the hill slopes. There really isn't a commercial road serving the area. Lake Murray Boulevard has a few businesses right around Parkway Drive which is how most people get in and out, but the neighborhood itself is exclusively residential. 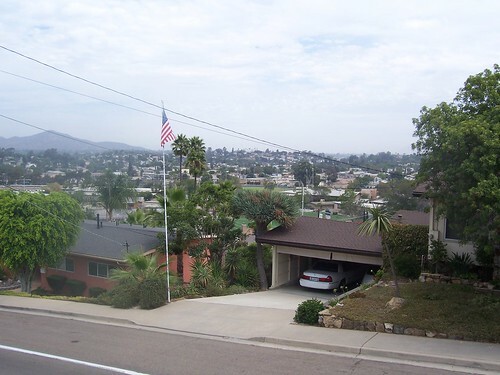 The views vary from good to excellent, looking out over the Alvarado Creek area and San Diego State, with the properties at the top of the hill having views over all of eastern San Diego. Physically, the houses are mostly single story 3 and 4 bedroom, 2 bath houses from around 1200 square feet to around 1600, sitting on lots of about 6500 to 8000 square feet. Many have been added onto, and they've pretty much all got individual character - a few were built as fill in or replacement in the 1970s and 1980s, but most were built in the 1950s and late 1940s, before the tract cookie cutter became a developer staple. Many use the older pier support, but concrete foundations became mandatory before the neighborhood was finished. Foundation issues and settling are rare, and those that existed have mostly long since been dealt with. As of this writing, asking prices start at about $360,000, but there are only four properties for sale in the neighborhood. 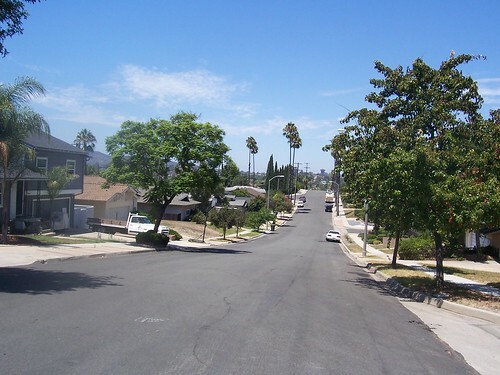 If you'd like to talk more about Connecticut Avenue or any other neighborhood of La Mesa, Contact me. I will be happy to discuss which neighborhoods might be right for you, or the marketing of your current property. A typical internal view, from Connecticut and Colorado. Notice all the mature shade trees? It makes a real difference! This is a the another in the series on the neighborhoods of the area I primarily work, which includes La Mesa, San Carlos, El Cajon and Santee. 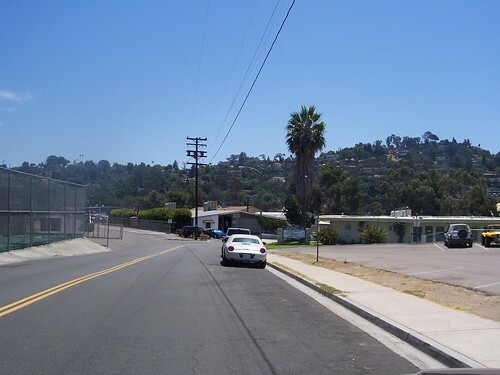 This time I'm moving to the eastern side of La Mesa, the area around Harry Griffen Park and Grossmont High School. 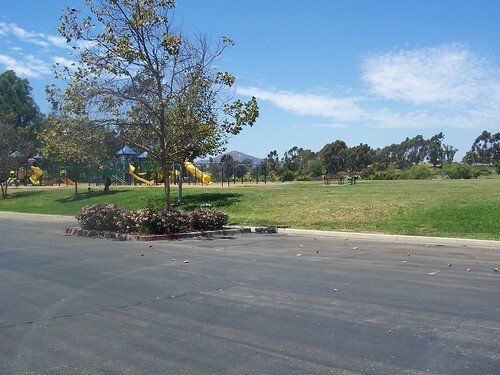 The Griffen Park neighborhood is bounded by Grossmont Center, Interstate 8, El Cajon City Limits, and Amaya Drive. The area immediately across Interstate 8 is pretty similar, which shouldn't be a surprise because this was originally one neighborhood that was split when the interstate came through. Once you're off the main streets, it's quiet. There's even a hidden area that feels like the country that you can miss if you don't know where to look. The main commercial artery in the area is Murray Street, which would feel almost like the main street of a one stoplight town if Interstate 8 wasn't right next to it. 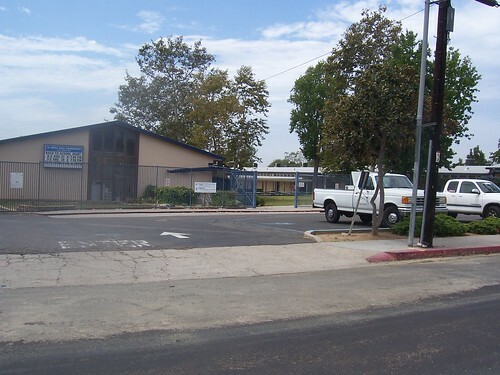 There's maybe a couple dozen businesses there, and that includes places of worship and Grossmont High School. The rest of the area is all residential except for Griffen Park. The homes were mostly built in the 1950s, with a significant percentage being built up to 30 years earlier. There are a few modern infill developments, the largest of which is off Milden Street behind the high school. The houses probably average 3 to 4 bedroom, right around 1600 square feet, on lots of about 7000 square feet. 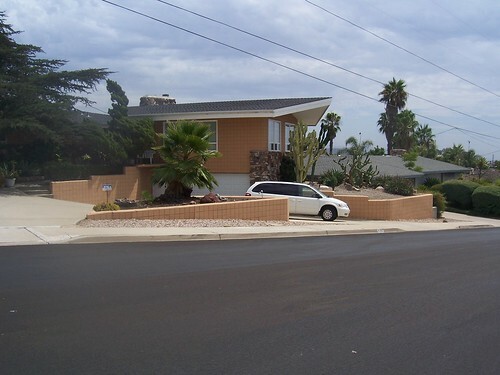 There are more tract homes here than in most other neighborhoods of La Mesa, but they've had the time to get added onto, so when you're driving through the neighborhoods, they don't look like somebody made them all with the same cookie cutter. There isn't much high density housing here - one fairly new townhome project is the only common interest development I can think of. This neighborhood is about 99 percent single family detached homes with no HOA. Not surprisingly, there usually aren't a lot of properties for sale in the area. As of right now, there's one beater with an ask of $300,000, but the next lowest asking price is $430,000, and they go up to $800,000. Families making San Diego Area Median Income (a little over $72,000 per year) will probably need a significant down payment to qualify for all but the cheapest homes in the neighborhood. The name of this street is Urban, a real misnomer. This is not a dense urban neighborhood. 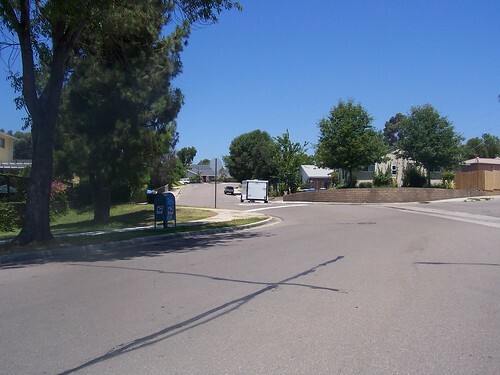 The streets are fairly straight, but there aren't always sidewalks, and other than nosy agents, there just aren't a lot of people in the area who don't live here, especially once you get off of Murray and Severin, where the easiest freeway access is. 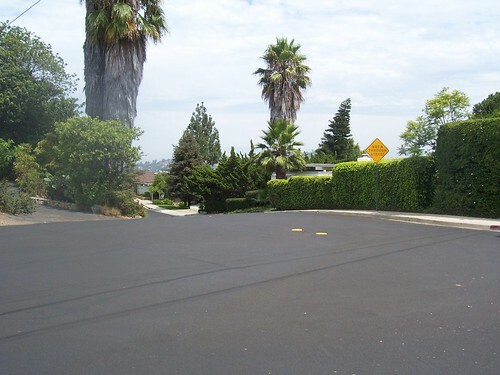 It's a pretty quiet place to live for the most part, and you would definitely get the wrong impression if you only drove the commercial streets. 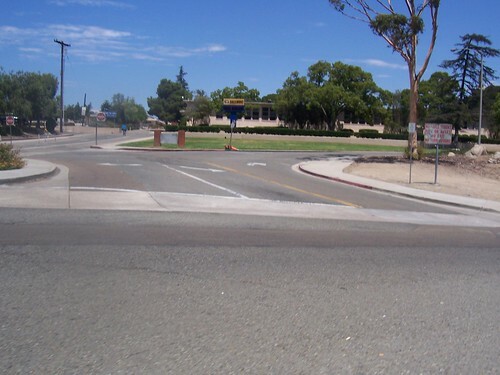 The closest community college is Grossmont College, reachable in a couple of minutes via 125. the closest four year college is San Diego State University. The back side of the high school on Milden, mostly included because I want to show you the view from the neighborhood to the south. That's Mt. Helix. 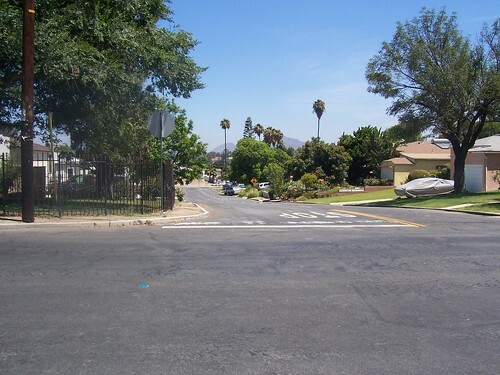 The Griffen Park neighborhood is very well connected to freeway access. There's onramps to and offramps from Interstate 8 at Severin Drive, and you can get to CA 125 pretty easy, too. If you're not on the freeway going the direction you want within a couple minutes of pulling out of your driveway, you're doing it wrong. There's three supermarkets within five minutes and you don't have to get on the freeway. For that matter, Murray Drive drops right into Grossmont Center, and you don't need or want to get on the freeway for that, either. You can get to Mission Valley in fifteen minutes, downtown in 20. The San Diego Trolley runs along Amaya and Water before it crosses Interstate 8 to go down into El Cajon, and there's a station at Amaya. Major shopping centers are found at Grossmont Center (Target, Wal-Mart, Macy's, Theaters and dining), which is within five minutes, and you can take the trolley or bicycle over. Parkway Plaza (Sears, Wal-Mart, Penneys, theaters) in El Cajon is roughly ten minutes, College Grove (Wal Mart, Sam's Club, Target) about the same. 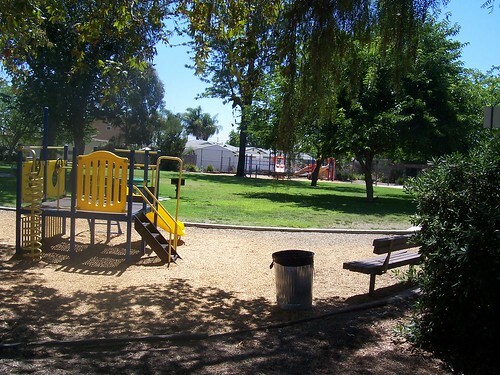 If you'd like to talk more about Griffen Park or any other neighborhood of La Mesa, Contact me. I will be happy to discuss which neighborhoods might be right for you, or the marketing of your current property. 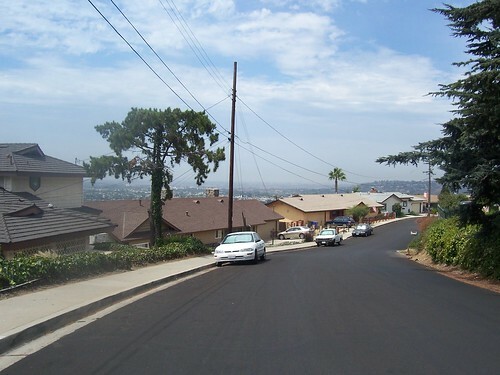 This is a the sixth of the series on the neighborhoods of the area I primarily work, which includes La Mesa, San Carlos, El Cajon and Santee. This time I'm moving to the eastern side of La Mesa. The main commercial arteries serving the area are Amaya Drive and Fletcher Parkway, despite there being only limited access to the latter. The businesses tend to congregate in the three neighborhood malls, at Severin and Amaya, 125 and Fletcher Parkway (the former site of Family Fun Center), and Fletcher Parkway and Dallas. Physically, there are almost two separate neighborhoods here. Along Amaya and Severin, the homes were built in the 1940s and before, and are typically around 1000 to 1200 square feet, these were originally two or three bedroom, one bath houses that have largely been added onto where they now three bedrooms, and one and a half to two bath. A significant number of these were replaced with higher density housing - apartments and condominiums - in the sixties and seventies. Once you get away from Severin and Amaya, however, the higher density stuff disappears and the neighborhood is essentially 100 percent single family three and four bedroom detached homes built in tracts in the fifties and early sixties, with some additions to those models here and there, but most are fairly close to the original floor plan. The lots start at about 6000 square feet, and I know of individual lots that go over a third of an acre (roughly 14,500 square feet). Asking prices vary as of this writing from around $290,000 for some of the older and smaller ones, up to nearly $600,000 for the high end. People making San Diego Area Median Income may not be able to afford the best houses in the neighborhood without a hefty down payment, but they can buy something very livable. This is not a dense urban neighborhood. 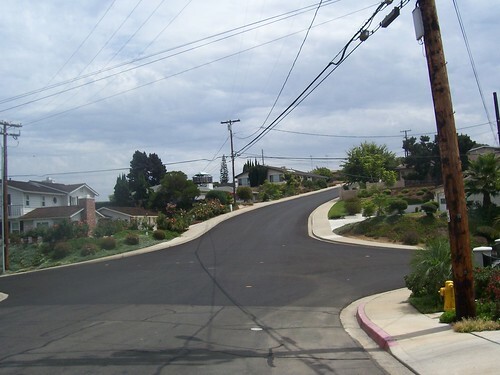 The streets are curvy, there aren't always sidewalks, and other than nosy agents, there just aren't a lot of people in the area who don't live here. It's a pretty quiet place to live for the most part, and you would definitely get the wrong impression if you only drove Severin, Amaya, and Fletcher Parkway. Norhtmont is a little more isolated that a lot of La Mesa. Nonethless, it does have good freeway and transportation access. It's two minutes up the hill to Interstate 8 via Severin, just across Fletcher Parkway to the newer CA 125 freeway running north south. You have your choice of two major supermarkets within a mile. You can get to Mission Valley in fifteen minutes, downtown in 20. 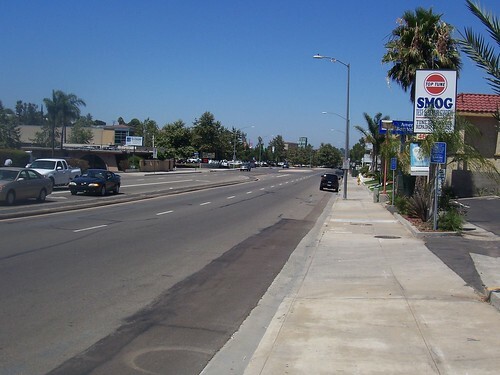 The San Diego Trolley runs along Fletcher Parkway and Amaya in the area, and has a station on Amaya. Fletcher Parkway is also a bus route. 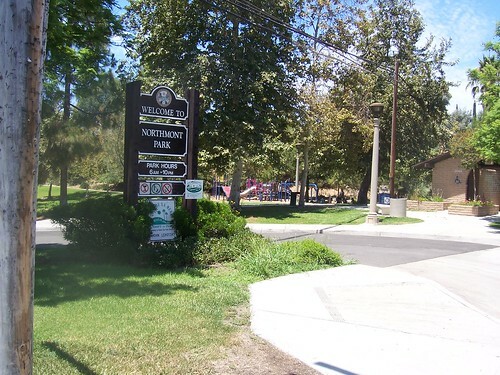 If you'd like to talk more about Northmont or any other neighborhood of La Mesa, Contact me. I will be happy to discuss which neighborhoods might be right for you, or the marketing of your current property. 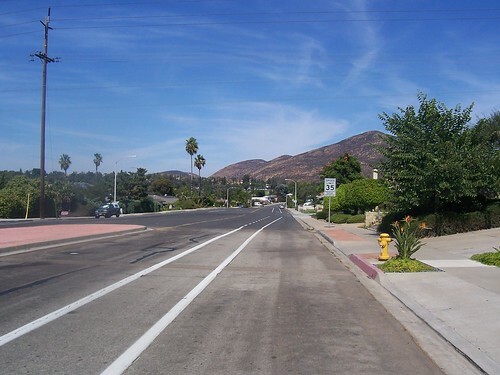 This is the fourth installment of a new series I'm starting, on the neighborhoods of the area I primarily work, which includes La Mesa, San Carlos, El Cajon and Santee. 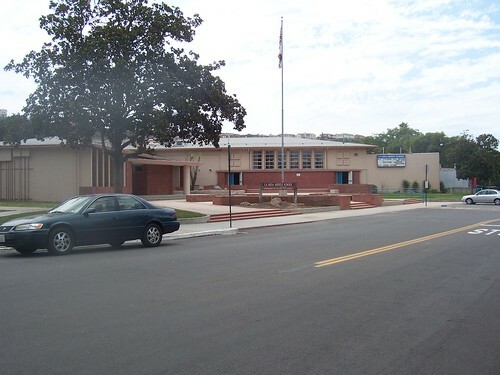 The Maryland Avenue neighborhood is bounded by Lake Murray Park on the north, Lake Murray Boulevard on the west, Parkway Drive on the south, and on the east side, Guessman Avenue and Maryland Avenue itself. The area a little further east off Wellesley Street has a substantially different feel and flavor. 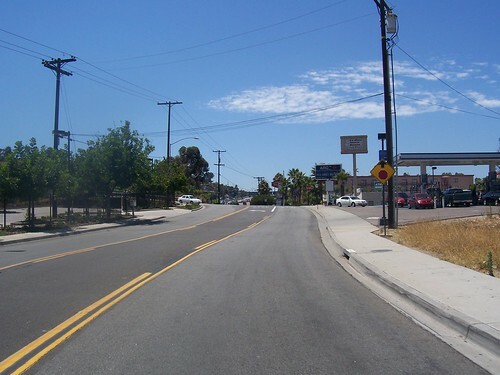 The main commercial artery serving the area is Parkway Drive, a frontage road for Interstate 8. Lake Murray Boulevard has a few businesses mostly right around the intersection of Parkway Drive, and is a major street, but once you get away from Parkway Drive, there's only four or five small stores, and the Starbucks at Kiowa is the only one that isn't basically a mom and pop operation. A neighborhood mall on Parkway Drive. People come from quite a way off for the Chickenest Restaurant, just left of center (pinkish). Physically, the houses are mostly smaller, two and three bedroom houses of 1000 to 1200 square feet. Most were built on piers rather than concrete slabs. 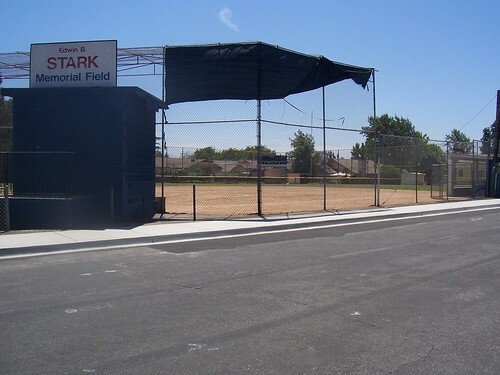 Many of them have been expanded since they were built, mostly in the 1940s and 1950s, and most of the lots are big by modern standards, 6000 to 7000 square feet. Hardwood floors are more the rule than the exception. Foundation issues and destructive settling weren't exactly unknown in the area, but mostly have been long since dealt with where they existed. Most have garages, split roughly half and half between one and two car varieties. Asking prices start about $320,000 and go up to about $480,000 for detached housing. People making San Diego Area Median Income can easily afford this area. 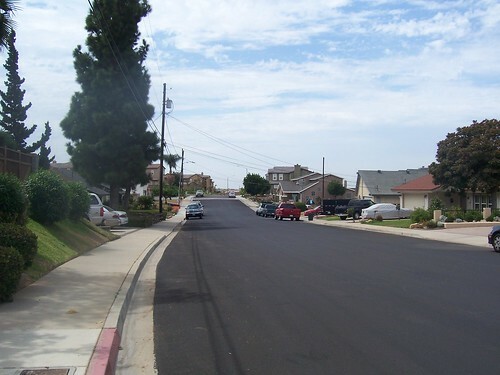 People drive by on the main roads in La Mesa, and assume the neighborhoods are the same, but they're not! 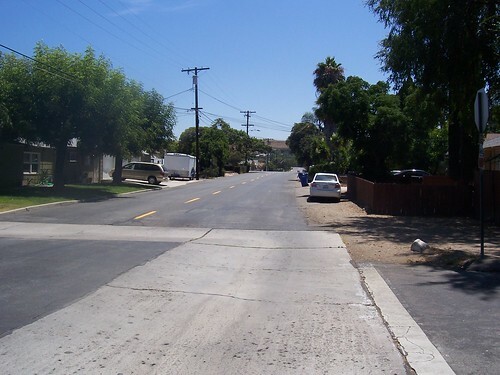 If all I ever saw was the main roads, I might not want to live where I do, but knowing the neighborhoods, I love La Mesa! There is some high density housing in this neighborhood, mostly on Kiowa and Maryland Avenue in the block just south of Lake Murray Boulevard. 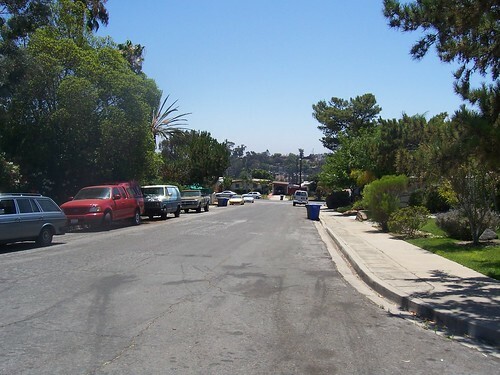 This area includes one of the only two sets of four bedroom townhomes I'm aware of in La Mesa. These are attractive to older people, those starting out with lots of kids, and others who need a fair amount of space (up to about 1800 square feet) but prefer not to do yard work themselves, like small business owners. Nonetheless, well over half the neighborhood residents are in detached single family dwellings. 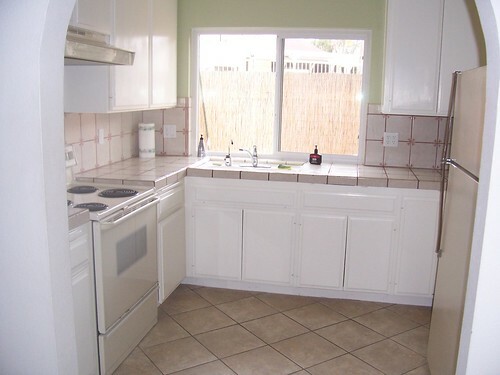 Here's a picture of the kitchen of one of the four bedroom townhomes (I took it over a year ago). You can't see the vaulted ceiling they have through most of the living areas, but they are very nice for folks who like the convenience, and have their own garages. Play area for kids, pool, clubhouse - all the reasons some people like townhomes. I may not live there myself, but I certainly wouldn't have any objections to doing so! Once you get a very small distance away from Parkway Drive and Lake Murray Blvd, the neighborhood is pretty quiet, and nobody aside from residents and real estate agents comes into it. 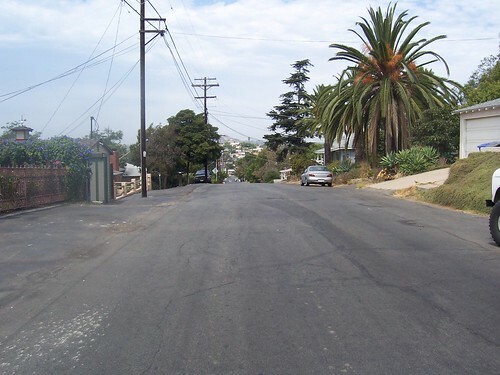 You do get some freeway noise from Interstate 8 right on Parkway Drive and for a few doors to the north of it, but once you get more than a block into the neighborhood, you'd never know the freeway was there from the noise. A lot of this has to do with the fact that the neighborhood goes uphill from there, so the noise gets blocked out. Point of Interest: Computer Museum of America and Coleman College, in a building that was formerly La Mesa Bowl, on Parkway Drive. If you you're interested in computers, it's a fascinating place! The neighborhood schools are Maryland Avenue, which their website tells me is now a Smart Steps Preschool Site. 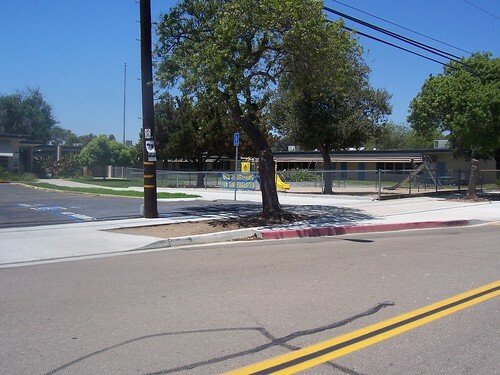 The Middle School is La Mesa Middle School (formerly La Mesa Junior High), and the high school is Helix Charter. Helix, in particular, has a long record of academic achievement. Here's the most recent account Helix Accountability Report Card. 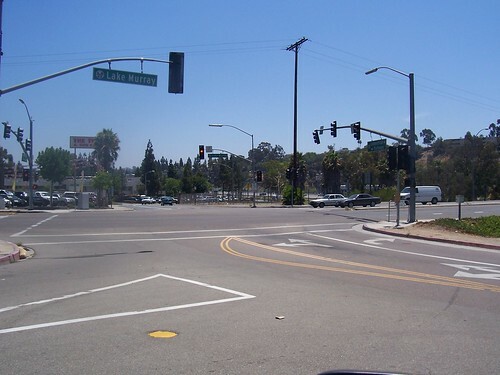 For some reason, lots of people not actually living in the area think that north of Interstate 8 goes to Grossmont High School, but this neighborhood goes to Helix - the real dividing line is approximately Jackson Drive, a mile or so further east. 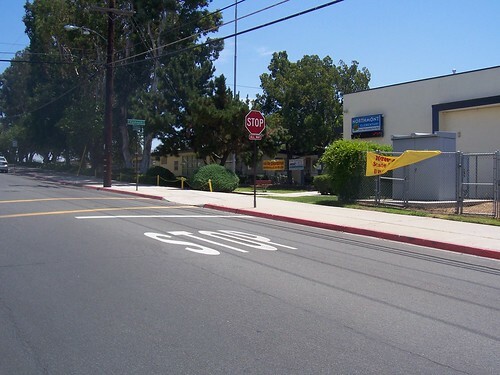 The closest community college is Grossmont, the closest four year college is San Diego State University, which is actually closer, but both are very easy for residents of Maryland Avenue to got to and back from. 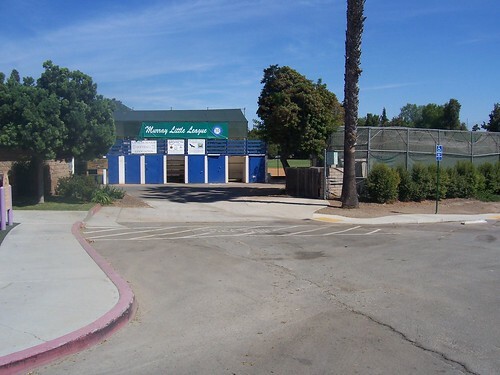 Just north of Lake Murray Boulevard is Lake Murray Park and Lake Murray itself, with all kinds of recreational activities from boating to jogging and hiking around the lake, to a golf course and driving range just across the lake. There are picnic tables and lots of parking if you decide not to walk over. Usually, there's fishing as well, but there's some kind of shellfish infesting the lake at this writing so that's kind of questionable. 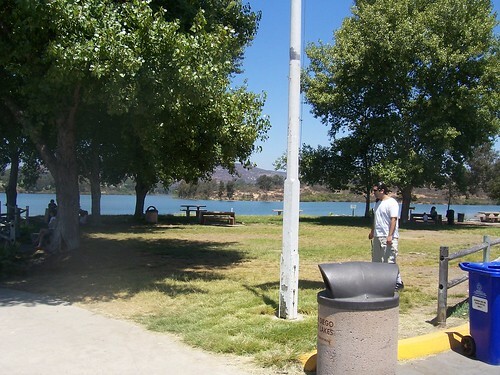 Lake Murray Picnic Area (Golf Course is on other side of lake behind the trees on the left) There's a 3.5 mile walking, jogging, and biking asphalt road that goes all around the lake except the dam itself. Maryland Avenue neighborhood residents find it easy to go places. It's two minutes or less to Interstate 8, and you don't even have to face any stoplights if you're headed west. 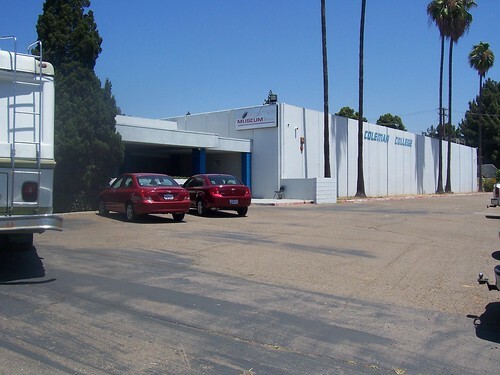 There are two major supermarkets within a mile, and if you're a fan of fresh fish, there's a very good fresh fish store at Lake Murray Boulevard and Maryland Avenue. You can get to Mission Valley in less than ten minutes. The San Diego Trolley runs adjacent to Interstate 8, and has stops at Alvarado Hospital and just east of 70th Street. Lake Murray Boulevard is a bus route, and I believe Parkway Drive as well but I can't recall seeing one any time recently. The closest major shopping center is Grossmont Center (Target, Wal-Mart, Macy's, Theaters and dining), and lots of other commercial stuff (Costco, Babies R Us) along Fletcher Parkway, Baltimore and Jackson. College Grove (Wal Mart, Sam's Club, Target) at College and 94 is about three miles, or you can get to any of the major Mission Valley malls in about the same time by car. 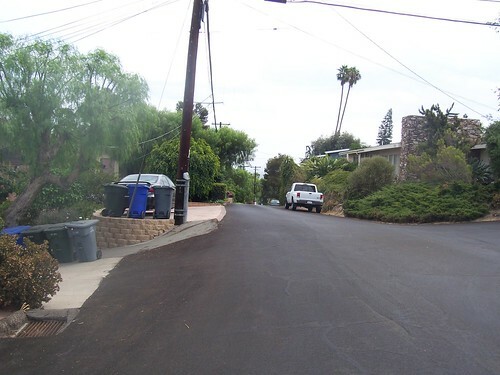 If you'd like to talk more about Maryland Avenue or any other neighborhood of La Mesa, Contact me. I will be happy to discuss which neighborhoods might be right for you, or the marketing of your current property. This is third installment of a new series I'm starting, on the neighborhoods of the area I primarily work, which includes La Mesa, San Carlos, El Cajon and Santee. 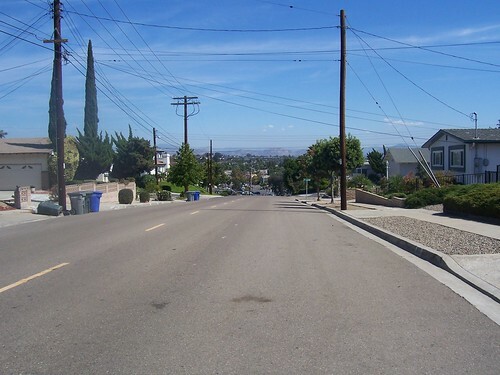 This area is bounded by Massachusetts Avenue on the east, California 94 on the south, the San Diego City Limits on the west, and University Avenue on the north. 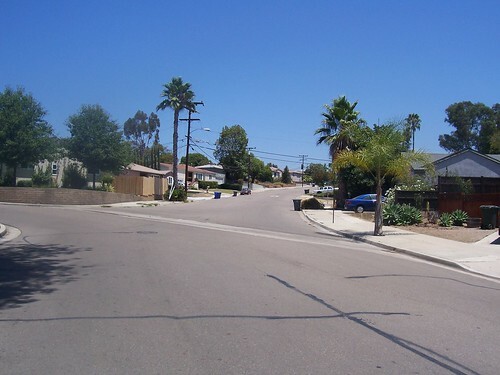 The area in San Diego west almost to College Avenue is broadly similar. 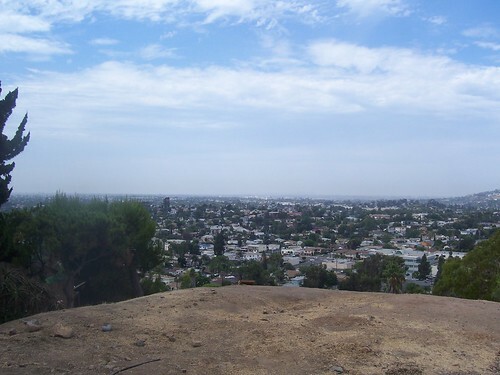 The area in La Mesa east across Massachusetts (Lemon Grove Vista) is perhaps slightly less desirable. 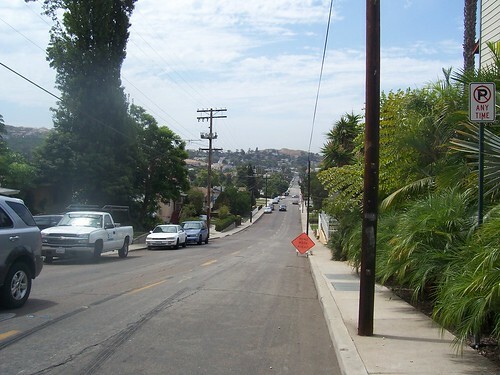 The main "neighborhood" streets are Waite and Hoffman (which becomes Celia Vista at the San Diego City Limits). Lois and King streets, which are essentially extensions of 70th Street, are used to a lesser extent. Marian has a light on University it shares with Harbinson on the other side of that street, but is very quiet once you get south of Boulevard Place (a short frontage road for University). 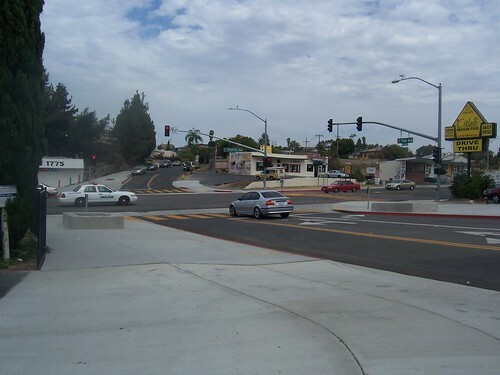 Keep in mind, this is the busiest corner inside the neighborhood, excepting only the commercial arteries on the edge! The main commercial arteries serving the area are University Avenue and Massachusetts Avenue. At one point in the distant past, there was a mini-mart on Hoffman but it's long since been converted to a residence. The area was mostly built up in the 1920s through the 1940s, and has been stable or slightly improving since the late 1970s. This was during the lunch hour rush. There's a freeway onramp just the other side of where I was standing. As you can see, it's not too bad. Just the other side of the freeway is a large neighborhood shopping center, including an In & Out Burger, if you're one of their many fans. Physically, the houses are mostly smaller, with a good sprinkling of what were originally two bedroom cottages of about 800 -900 square feet, but most of the neighborhood is three bedrooms now with maybe 20% being four. Most properties have garages, split about half and half between the one and two car variety. Far more use piers than concrete foundations. Large numbers have been modernized, but hardwood floors are still more the rule than the exception. The lots are typically 6500 square feet up to about 9000 or thereabouts, so they originally had plenty of room for additions, and perhaps half have had at least one extra bedroom or bathroom added, most of these before permits were required and therefore grandfathered in. Architecturally, Craftsman style is quite common, but pretty much every house is different from every other, and there's only one small cookie cutter development of about a dozen dwellings in a PUD that was built maybe fifteen years ago as a fill-in. Foundation issues and destructive settling aren't unknown, but most of those issues have long since been dealt with. 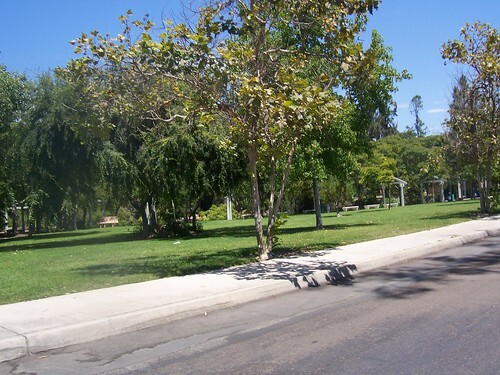 Mature trees are perhaps less common than some other areas of La Mesa, but there's no shortage of them here. Once you get away from the main commercial streets, this is a nice quiet neighborhood. At least one resident kept a couple of horses as of a couple weeks ago. The corridor between Boulevard Place and University is noisy and busy, as is the stuff right on Massachusetts Avenue, but once you get onto the neighborhood streets, traffic is sparse and about the only high density housing I can think of is on Waite Drive between King and Massachusetts. By and large, it's all single family detached housing. Gas Under $4 Per Gallon in San Diego! This page is a archive of recent entries in the Neighborhoods category. Loans Available for Locking is the previous category.